Challenges - Graphic Novel Book Challenge and Library Challenge. I am so thankful to everyone who recommend this book to me, as I thought it was absolutely wonderful. I was lucky enough to pick up a copy which had both Persepolis 1 and Persepolis 2 in it. Both are graphical memoirs of the author's life at different periods of time. 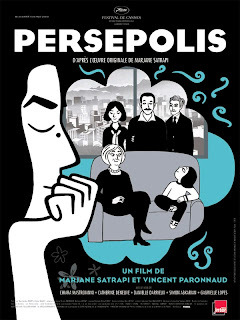 Persepolis 1 looks at Marjane's childhood in Iran during very turbulent times. Marjane grew up during the Islamic Revolution and the book covers her life from the age of six through to fourteen, where her parents decided to send her to school in Austria. Marjane's parents were very Westernised and were very outspoken about the changes enforced upon the country and its people. This put Marjane in a dangerous position as she had become just as outspoken as her parents and very rebellious. She left the country, never knowing whethere she would see her parents again. Persepolis 2 follows Marjane's life from her teens through to adult hood. You get the feeling, that she feels like an outcast in Austria and also an outcast when she returns to Iran after becoming more Westernised. Both books are broken up into mini episodes dealing with different events and aspects of her life. I found both of these books really interesting to read. The story was heart wrenching, whilst simultaneously being humorous. I wonder if I would have read them if they had not been in graphic form and I think that I probably wouldn't. The joy of reading them in graphic form, allowed me to understand the difficulties and problems that arose during the revolution. I felt I came away wiser and more knowledgeable about the history of Iran. Marjane's fight to become just like one of us, was very compelling. She refused to become the woman her country expected her to be. From a young age, she witnessed horrific events, including the death and execution of people close to her. Over the years, I have seen many Iranian women wearing the veil and I always presumed they were happy to wear them for religious purposes. Not once had it ever occurred to me that they hated wearing them and how uncomfortable they must have been. It was expected of them to wear the veil in order to shield them from sexual advances from men unable to resist their flowing hair and facial features. I felt that this story has given me a good opening point in order to read more about the Islamic Revolution and the people who lived through it. In parts of the story, I actually found myself laughing as Marjane made fun of the constant changes within her country's culture and beliefs. Marjane made a long history of war and revolt into a page turning event full of humour and sadness. I get the impression that Marjane is capable of seeing the funny side of life, even when she is feeling troubled. I don't feel my review is doing this book justice and I have to admit to finding it a little difficult to review a graphic novel, which is a genre that I have only just started to read. I definitely recommend reading this book, especially if like me, you have no prior knowledge of the history of Iran; it is definitely a good starting point. I think your review is fine! I enjoyed Persepolis 1 far more than 2, but altogether this was an excellent book. And I like Satrapi's other books even better! Embroideries and Chicken With Plums are both excellent, though different from Persepolis and from each other. This sounds so good. Like you I know nothing about what's gone on in Iran and also thought the same about the veil. Your review is excellent and your enthusiasm for the book really does come through. It is difficult to review a graphic novel, but you did a fantastic job. I thought this book was great too! You did a great job reviewing! I have never read these, but I seem to be one of the few left who have not :) I really like my new toe-dipping into the GN genre. It's really interesting to see so many different styles of drawing and writing in it. Blodeuedd - definitely worth a read and it be honest I wouldn't say it was a quick read, as there is so much information to be absorbed. Amanda - thankyou. I hope to go for Embroideries next. Carmen - I really think you would enjoy these graphic novels everyone is talking about. Aarti - I am a newbie too when it comes to the graphic novels, but I have enjoyed what I have read so far. You did great with the review, I have heard good things about Persepolis. I havent read any graphic novels myself yet. This one does sound really good. I read Embroideries, which is very wild and quite humorous. Your review of Persepolis is insightful and I'd like to read this book as well. Thanks, Vivienne! Great review. I just finished Persepolis as well (I am actually have my review set to post tomorrow) and I loved it. I only read the first one and the bookstore doesn't have the second one in stock so I am anxiously awaiting a delivery. Persepolis is one of my favorite books of all time. I loved it to bits. If you want to try another graphic memoir, try Maus. It's just as excellent. I'm so happy you loved it, Vivienne! This is definitely one of my all-time favourite graphic memoirs. My review of it (only the first book) will be up tomorrow. I also found it hard to review it. It was my first graphic novel (then I quickly read Maus) and now I'm excited about reading more. Naida - you should definitely try one of these graphic books, they are really good. Suko - thank you. I hope to read Embroideries soon too. Jess - I shall pop over to see your review. Mee - I shall look out for Maus too now. Nymeth - it was fabulous. I can't wait to read more of her work. Clover - it was definitely harder to review than a normal book. I shall pop over to see your review too. This was my very first graphic novel and it hooked me for sure! The buddy read - welllll...I've never done one either. *grin* I just know I've been meaning to read that book for a gosh darn long time and figure if I have someone reading along with it I'd actually do it. Perhaps I'll post an inquiry post to my blog this weekend to find out how others go about doing it to get thoughts. The images really do carry a strong impact in these graphic novels. I have to say that I liked the first volume a lot more than the second, but they were both good. Great to hear you enjoyed it! I also recommend her other books which serve to give you more of a glimpse into her country.